The Interim Report of the Steering Committee (IRSC) offers a selection of options on some Articles of the Constitution and provides a view of plausible future directions that the Sri Lankan constitution drafters hope to take. This article is an attempt to analyze a few of the key contents of the Report for purposes of enhancing public discussion. The reason quoted by the authors of IRSC for not including the term ‘unitary state’ is that the “classical definition of the English term ‘unitary state’ has undergone change”. The IRSC has cited the United Kingdom case as an example. However, the United Kingdom so far has had no constraints in using the authority derived under its unitary constitution to thwart attempts at leaving the Union. Being a unitary state, the Parliament of the United Kingdom is the sole, sovereign and supreme constitutional (making) authority in the Union, and power is devolved to Scotland, Wales and the Northern Ireland by the constitutionally superior United Kingdom Parliament. In a unitary state such devolved power can be further increased, reduced or withdrawn by the sovereign centre, in this case the UK Parliament. This is proved by the fact that the power devolved to the Northern Ireland Assembly was withdrawn in October 2002. Devolution was restored to Northern Ireland in May 2007. However, since 1997, an argumentative fog has begun to shroud the clarity of opinion regarding UK Parliament’s authority to withdraw devolved powers. Even if one were to accept this controversial view, that deficiency is certainly not rooted in the unitary system of governance, but in the irresponsible and short-sighted manner in which some United Kingdom Governments had awarded devolution to Scotland etc. If as opined, the unitary state of United Kingdom was bereft of such powers, the United Kingdom would have stood partially dissolved when the Scottish Parliament adopted a motion seeking separation from UK in 1999. To understand this we need to backtrack in time. In the last few decades, it was the Conservative Party that was apprehensive of offering devolution to Scotland, Wales and Northern Ireland while the Labour party had been more forthcoming on this issue. It is logical to argue that the ‘differentiation of views’ on devolution between the two main political parties in the UK had been used to leverage increasing devolution to constituent entities, to the detriment of the Union. In May 1997, the Labour Party of Tony Blair was elected with a promise of creating devolved governing institutions in Scotland and Wales. This culminated in the creation of a Scottish Parliament and similar institutions in Wales and Northern Ireland. With that creation, United Kingdom became what can be called ‘a unitary state with devolved regions’. Many liberal political scientists and constitutional experts theorize that when a province or a state (that mainly uses ethnic, language, or religious identity politics to achieve political goals) is offered comprehensive devolution, it would satiate the hunger for separation. But to the consternation of the Blair government and most pro- devolutionists, the Scottish Parliament adopted a motion in 1999, calling upon the UK Parliament to repeal the Act of Settlement that originally linked Scotland to the United Kingdom. That is, Scotland asked for separation from the United Kingdom. (And this call was made within about a year of winning comprehensive devolution) In this instance separatist tendencies had been fed on maximum devolution. Basically, it was the unitary system of government that saved the United Kingdom. Prime Minister Blair invoked the powers of the sovereign United Kingdom Parliament, declaring the motion of the Scottish Parliament ultra vires. Though some perceive this emerging situation in UK to be a crisis of a unitary constitution, it really is a pure and simple political trap that UK laid on itself by its own action of offering almost unlimited devolution, without any concern for its own stability. Theoretically, the United Kingdom can still withdraw all or part of devolution powers granted to Scotland, Wales etc. 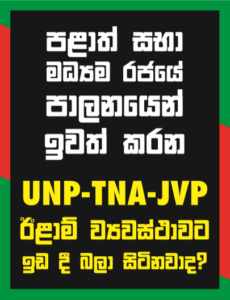 under powers vested under the unitary constitution. But the challenge is the political feasibility of instituting such suspension action because the UK government then in power would have to be ready to absorb the negative political repercussions and still strive to govern effectively, in a highly liberal western democratic environment. But this ‘political constraint’, too, is still pure conjecture, as in the 2014 Referendum the people of Scotland voted not to leave the Union. And the definition of the English term ‘unitary state’ still remains the same in English Language as well as in Constitution terminology. A Google search on ‘unitary system’ will prove this fact. – Power had been devolved to Scotland, Wales, and Northern Ireland, mainly as reaction to particular events as they arose. There had been no consistent strategic thinking on devolving power as well as in instituting counter-balancing steps to protect the integrity of the Union in such eventualities. The main finding is that power had been devolved without a concern for the protection and integrity of the United Kingdom. – A key suggestion is that while interest of the Regions should be taken into consideration in devolution that must not be at the expense of stability, coherence, and viability of the United Kingdom as a whole. The other advantage in adopting the universally accepted terminology “unitary state” is that it would not precipitate an unnecessary definitional and or legal tangle, as compared to the untested term ‘aekiya rajya /orumiththa nadu’. It is well known that all judicial interpretations on the term and concept ‘unitary state’ had been done in the English language even in Sri Lanka. As such it is an additional incentive to stay with the well defined and accepted terminology – ‘unitary state’. This could prevent Sri Lanka from being subjected to a long and divisive definitional controversy. As described earlier one of the main reasons for the current constitutional predicament faced by the United Kingdom had been the haphazard way that power had been devolved to Scotland etc., without methodically and realistically assessing the negative effect on the integrity of the Union, and taking commensurate balancing action to off-set such negativity. The House of Lords has done a comprehensive analysis on this aspect. John Curtice, Professor of Political Science at University of Strathclyde, in his submissions to the House of Lords panel observed that “in so far as one of the purposes of introducing devolution was to cement Scotland’s place in the Union it has not clearly succeeded”. The findings related to UK also raise genuine concerns about the IRSC recommendation for Sri Lanka included in the section titled Article 1 and 2. namely “Maximum devolution should also be granted”. The United Kingdom gave maximum devolution in the hope that Scotland would stay within the Union, but the opposite happened. UK union was saved by the skin of its teeth, thanks to the unitary Constitution. Currently Spain finds itself in a more serious predicament with Catalonia’s illegal referendum. Both the United Kingdom and Spain are two good examples for illustrating the truism that ‘giving maximum devolution’ and ‘protecting the integrity and the stability of the whole State’ are irreconcilable constitutional actions. This is vitally and desperately applicable to countries that include sub-national units using ‘ethnic identity politics’ as the main platform of their territory-based agitation for greater devolution. The question then is – Should the Republic of Sri Lanka too take the same road and commit the same mistakes? President J.R. Jayewardene who introduced devolution to Sri Lanka had already answered this question for us. He clearly showed us where the limits of devolution should lie. The risks to the Republic remain. We should, still, abide by his wisdom. In the meantime, we certainly should and can move on proposals such as the creation of a second chamber etc that symbolizes our genuine intentions regarding inclusivity while simultaneously protecting the State of Sri Lanka. This approach would be in the best interest of all Sri Lankans of all communities (irrespective of political affiliations) who are genuinely and rationally interested in the stability of the unit called ‘whole Sri Lanka’. Development support is also vital at this stage. The central government in genuine consultation with the northern provincial council and eastern provincial council should help accelerate practical and workable livelihood stabilizing programmes for the disadvantaged families as well as support programmes such as drinking water supplementation in the Jaffna peninsula etc., identified through a local needs assessment, which are the most vital from a people’s perspective.